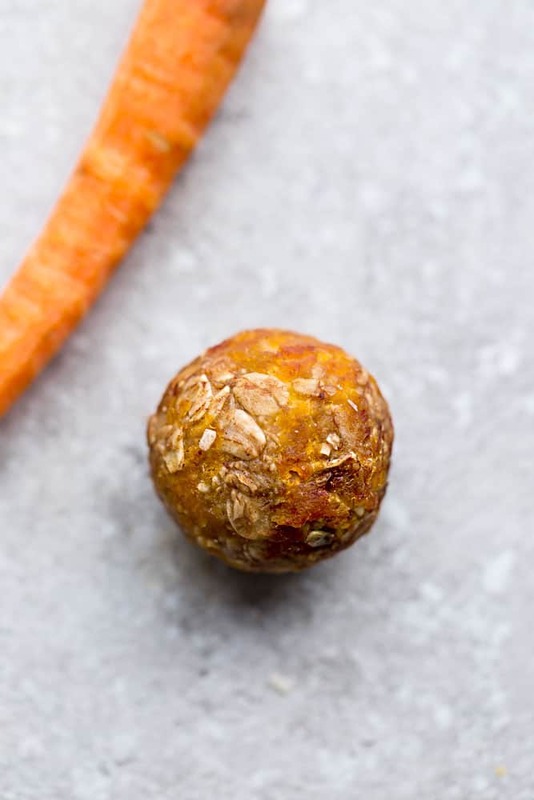 Carrot Cake Energy Bites – a delicious and healthy no bake breakfast or afternoon snack. Made with wholesome simple pantry ingredients and perfect for on the go or after a workout. Gluten free and refined sugar free. 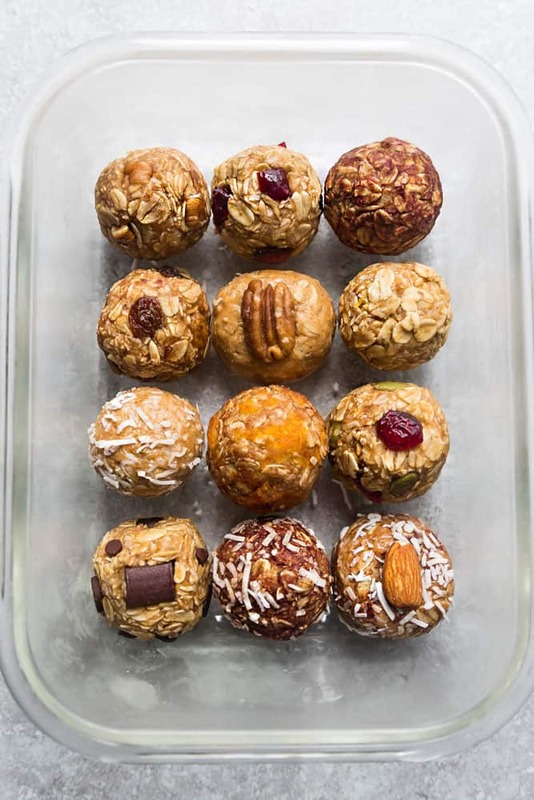 Energy bites and energy balls are one of our favorite healthy snacks to make. They come together in less than 10 minutes which just a few simple pantry ingredients. Plus, since they’re no bake, you don’t even need to turn on the oven which makes them the perfect recipe all year long! And since Easter is just around the corner, these no bake carrot cake energy bites are the perfect treat for spring. 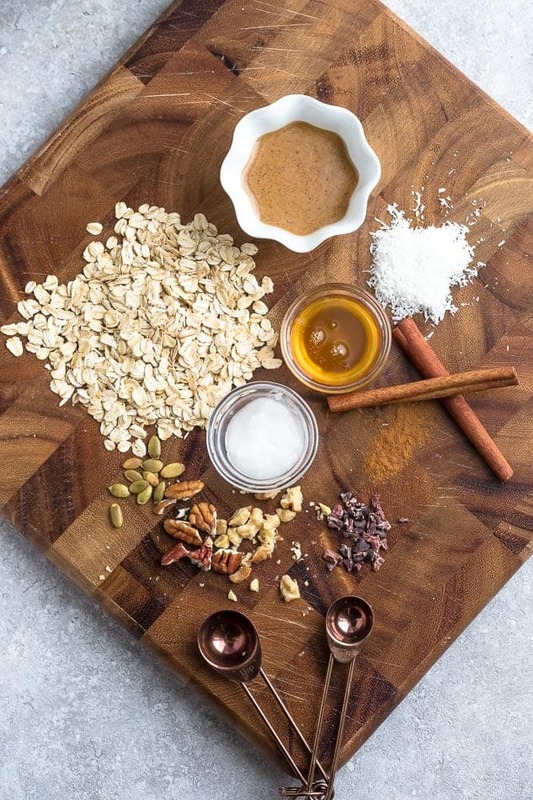 My family is crazy about carrot cake and these healthy carrot cake energy bites are a great way to curb that classic carrot cake craving. They have all the delicious flavors and spices but are made with wholesome ingredients without any refined sugar. Plus, these tasty carrot cake treats require less than 5 minutes of prep time and are gluten free and vegan. And the best part is how easy they are to customize with whatever ingredients you like or have in your pantry. 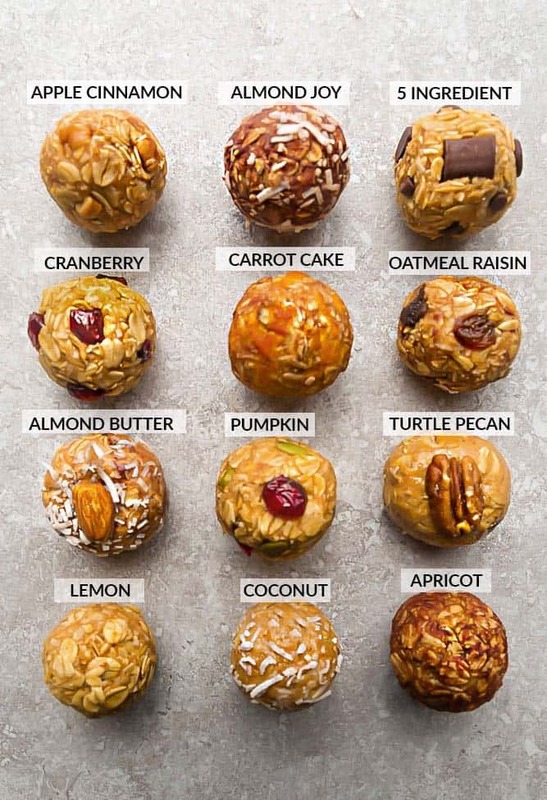 WHAT INGREDIENTS DO I NEED TO MAKE CARROT CAKE ENERGY BITES? HOW TO MAKE CARROT CAKE ENERGY BITES? You’re going to toss the dates, apricots and nuts in a food processor or high-powered blender until roughly chopped. 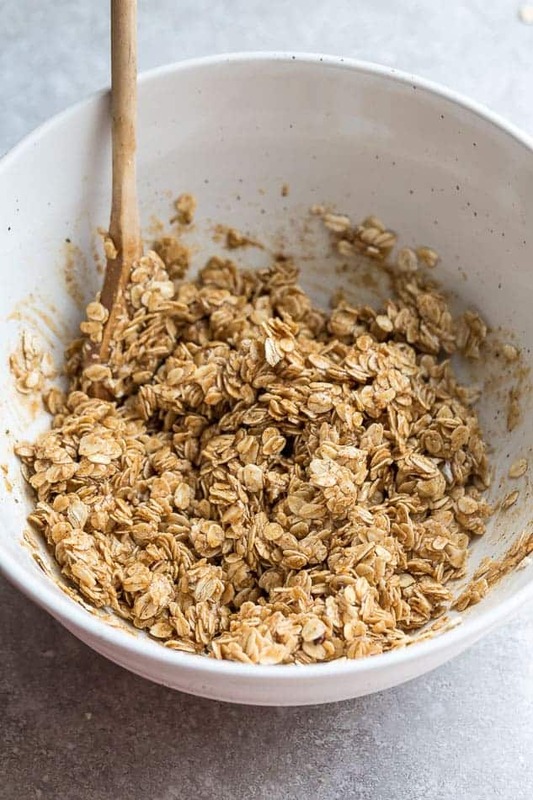 Add the pecans, carrots, coconut, oats, coconut oil, vanilla and spices and continue processing until the batter is combined into a sticky “dough” like consistency. Form and roll dough tightly (wet hands slightly if needed) into 1″ – 1.5″ balls. Store in airtight container in refrigerator or freezer for a quick and tasty treat anytime you need one. 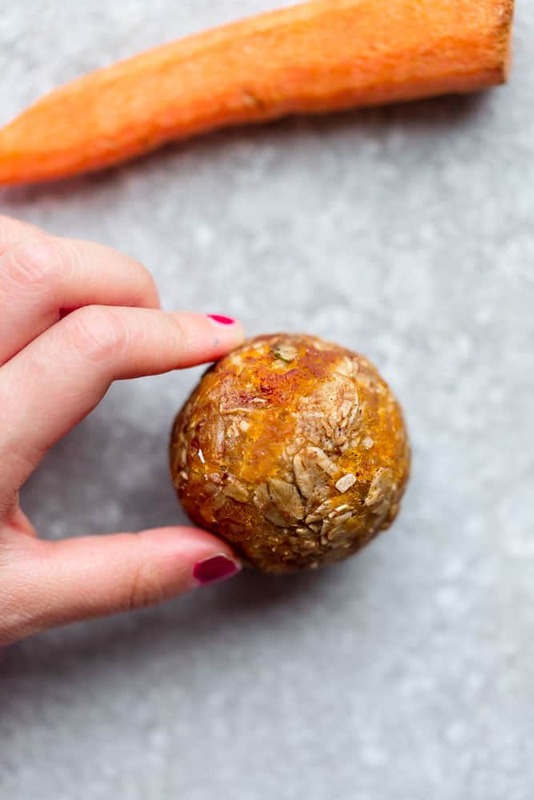 These Carrot Cake Energy Bites are the perfect after workout snack or anytime you’re craving something sweet (like a cookie?). They’re a super convenient snack for on-the-go or packing into your work or school lunch boxes. You can add protein powder to make them more substantial or feel free to toss in any other add-ins you like. ARE CARROT CAKE ENERGY BITES FREEZER FRIENDLY? ARE CARROT CAKE ENERGY BITES HEALTHY? 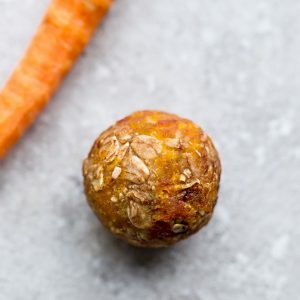 Carrot Cake Energy Bites - a delicious and healthy no bake breakfast or afternoon snack. Made with wholesome simple pantry ingredients and perfect for on the go or after a workout. Gluten free and refined sugar free. Place the dates, apricots and nuts in a food processor until roughly chopped. Add the remaining ingredients and pulse until combined into a sticky "dough" like consistency.